By the mid-1980s, there were three generally accepted methods of analyzing for gunshot residues: neutron activation, flameless atomic absorption spectrometry (FAAS), and scanning electron microscope-energy dispersive x-ray spectrometry (SEM-EDX). All threemethods werebasedonthedetection of metallic elements (principally barium, antimony, andlead)originatingin primers and deposited on the back of the hand firing the weapon. Although all three compounds were found in the primers of virtually all centerfire cartridges at that time, this was not necessarilythecasein rimfireprimers. Thus, until the mid-1980s, Remington rimfire cartridges contained only lead in their primers whereas they now containleadandbarium. CCIand Winchester rimfire ammunition contain lead and barium; Federal, lead, barium, and antimony. In the mid-1990s, centerfire cartridgesfreeof allthreemetallicelements were introduced for use in indoor ranges by Americanammunitionmanu-facturers. In Europe, Sintox had been manufacturing such ammunition since the 1980s. Analysis of primer residue reveals the presence of strontium in CCI lead-free ammunition, potassium in Winchester's, calcium and silicon in Federal's, and titanium and zinc in Sintox.7-8 In the case of CCI ammunition, the bullets have a lead core encased on all surfaces by a thick coat of electroplated copper. Remington ammunition is loaded with a full metal-jacketed bullet whose base is plugged with a copper disk, preventing vaporization of lead from the lead core. Winchester loads bullets with a copper jacket and a tin core; Federal a zinc core and copper jacketing. By the 1990s, neutron activation had been discarded as a method of analysis. This was due not only to limitations in analytical capabilities (it can analyze for antimony and barium but not lead and, thus, had to be used in combination with FAAS) but, principally, because of the need for access to a nuclear reactor to perform tests. Use of FAAS techniques for detection and quantitation of gunshot residues is very popular in crime laboratories in the United States because of a combination of ease of analysis, adequate sensitivity and low cost. FAAS will detect antimony, barium, and lead from the primer as well as copper vaporized from either the cartridge case or the bullet jacketing. In this method of analysis, four cotton swabs moistened with either nitric or hydrochloric acid are used to swab the palms and backs of the hands (Figure 12.2) in order to recover the metallic components of the primer. A fifth swab is moistened with the acid and acts as a control. The cotton-tipped swabs should have a plastic shaft as wood shafts may contain barium and, thus, theoretically, could contaminate the swab. Based on the distribution and amounts of antimony, barium, and lead detected on the four surfaces of the hands, one may conclude that the deposits are or are not consistent with gunshot residue and are or are not consistent with firing a weapon. Typically, when one fires a gun and residue is deposited on the hand, it is on the back of the firing hand. Detection of primer residue on the palms of the hands, instead of on the back of the suspected firing hand, is suggestive of a defensive gesture rather than of firing a gun. It can also be due to handling a gun coated with firearms residue. In suicides with handguns, primer residue on the palm may be due to cradling the gun with this hand at the time of firing. With rifles and shotguns, residue is virtually never detected on the firing hand using FAAS. Residue is often detected, however, on the non-firing hand that has been used to steady the muzzle against the body. The residue is detected more commonly on the back rather than on the palm. Occasionally, only high levels of lead are detected on the non-firing hand. It is hypothesized that the absence of antimony and barium is due to the fact that only small quantities of these elements are used in the primer and that they precipitate out inside the long barrel before they have a chance to exit in elevated levels. 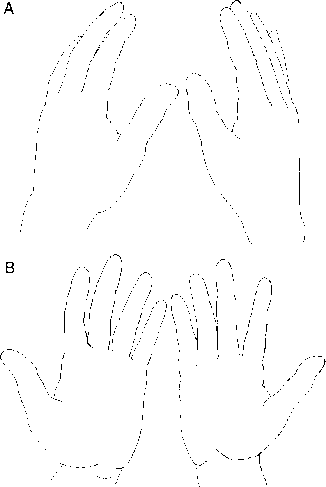 Figure 12.2 (A) Area to swab on back of hands; (B) Area to swab on palm of hands. In the author's laboratory, when FAAS was used, levels of antimony, barium, and lead were considered significant only when they were above 35 ng for antimony, 150 ng for barium, and 800 ng for lead. For centerfire weapons, a hand washing was generally considered positive (consistent with gunshot residue) when all these three elements were present, and at least the lead was elevated. Marked elevation of barium alone may be due to the presence of soil rich in barium. To correctly interpret the significance, if any, of a positive test result, one must take into account the surface area of the hand that is positive (left palm, right back, etc. ); the quantity of metals deposited on the different areas, the nature of the weapon and, in self-inflicted wounds, the nature and location of the wound. The classical picture of an individual who has fired a handgun is a positive test result on the back of the firing hand and negative results on the other surfaces of the hands. If an individual, instead of firing the weapon, put their hand up in a defensive gesture, with their palm toward the weapon at the time of discharge, elevated levels of primer residue will be present on the palm and sometimes on the back of the hand. In the latter case, primer residue on the back of the hand occurs when the whole hand is engulfed in a cloud of vaporized primer residue. The levels of metal on the back of the hand will be lower than those on the palm. The following are actual cases from the author's laboratory. They represent a fair cross-section of the type of cases that are encountered. Case 1. Hand washings in this case showed no evidence of gunshot residue. This is as it should be, as the individual was a young male dying during an episode of diabetic ketoacidosis. Case 2. This case was also negative for firearm residues. The individual died of stab wounds. The markedly elevated levels of barium present on the back and palms of the hands were due to contamination, probably by soil, which is very rich in barium in some areas of the country. The levels of lead and antimony were in background concentrations not consistent with the gunshot residue. Case 3. 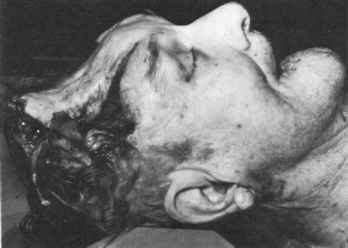 This test was interpreted as positive for gunshot residue on the back of the deceased's right hand. The deceased shot himself in the head with a .38 Special revolver, using the right hand. Case 4. This individual shot himself in the mouth with a .38 Special revolver. At the scene, the deceased's left hand was around the barrel. Hand washings were positive for primer residue on the back of the right hand and thus were consistent with the individual having used this hand to fire the weapon. Markedly elevated levels of primer residue were also present on the back and palm of the left hand. This hand was used to hold the muzzle in the mouth. Case 5. This is a case of an individual who shot himself in the right temple with a .410 shotgun. The deceased used his left hand to hold the muzzle of the weapon against his head. The right hand, which was used to fire the weapon, not unexpectedly with this type of weapon, is negative. The back of the left hand shows elevated levels of primer residue. Case 6. This is an example of an individual trying to ward off his attacker. There were significant levels of antimony, barium, and lead on the palm of the right hand. Case 7. This is a variation on Case 6. Significantly elevated levels of primer residue were present on the palms of the hands. The backs of the hands show elevated levels of lead and, in the case of the right hand, antimony. In this case the hands were probably outstretched toward the weapon and were enveloped by a cloud of residue, thus accounting for the elevated levels of lead on the back of the hands. Case 8. This is an example of a lead cloud from a high-velocity bullet that has passed through an object with resultant pulverization of the lead core, production of a lead cloud, and coating of the individual who was in the vicinity of the lead cloud. The deceased was shot through a car door with a high-velocity hunting bullet. Lead levels are markedly elevated. Barium levels are negative, with antimony levels elevated. The elevated antimony may have resulted because antimony is used to harden lead. The difficulty with FAAS analysis is that one can never be absolutely sure that one is dealing with firearms' residues. FAAS is a bulk, elemental analytical method involving measurement of the total quantity of metallic residues removed. One cannot distinguish the source of the metals. In addition, this technique has a high percentage of false negatives. Stone found that of individuals who committed suicide with centerfire revolvers, in only 50% of the cases were handwashings positive for gunshot residues.9 In cases where a semi automatic pistol was used, this figure dropped down to 32%. For .22 rimfire revolvers, the figure was 23%. These figures are in agreement with the authors experience. This illustrates the fact that a negative test for gunshot residue is meaningless. It does not prove that an individual did not fire a weapon. In living individuals, as the time interval between firing and the taking of samples increases, there is a rapid loss of the residue from the hands. This can be produced not only by washing the hands but just by rubbing them against materials. In living individuals, the analysis is virtually always negative when the time interval is greater than 2 to 3 hours. The third method of analysis employs a SEM-EDX capability.5,6 Gunshot residue particles are removed from the hand using adhesive lifts. The material removed is scanned with the SEM for gunshot residue particles. These consist of discrete micrometer-sized particles, often of a characteristic shape. The X-ray analysis capability is used to identify the chemical elements in each of the particles. Some police agencies, in an attempt to link a gun with an individual, use TMDT. These tests depend on the detection of trace metals left on the hand as a result of handling a gun. The metal forms characteristic color complexes with a reagent sprayed on the hand. Different metals produce different colors. The pattern and color produced depend on the shape and metal content of the weapon. Whether the pattern and color are present depends on how long the weapon was held and whether the individual was sweating. As sweating increases, the pattern and color increase in prominence. The initial TMDT involved the use of 0.2% 8-hydroxyquinoline solution with viewing the hand for color patterns under ultraviolet light. Positive results were obtained for 36 to 48 hr after handling metal. A new reagent, 2-nitroso-1-naphthol, does not require viewing under ultraviolet light.10 Metallic patterns using this reagent last only 4 hr or less. The problems inherent with TMDT are its lack of specificity and in the case of the original reagent the long time period during which trace metal can be detected. Only rarely in actual practice is the characteristic pattern of a weapon produced on the hand, e.g., emblems or designs. More often, one has only a poorly defined area of color change. The trace metal that produced this color change could have come not only from a gun but an iron railing, a tire iron, and so forth. If the original reagent is used, the individual could have handled a metal object other than the weapon as long as 1 to 2 days previously. Thus, in actual practice this test is more subjective than objective. * Personal communication: James D. Garcia.